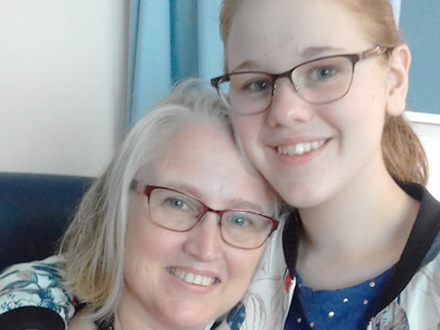 In remission: Tamlin Hall and her mum Kerrilee. IN February 2017, 13-year-old Tamlin Hall split her leg open on a flight of timber stairs at her family home in Brisbane. She was taken to the emergency room for what she thought would be routine surgery. Days later, she was fighting for her life. “I remember looking down and seeing blood and white fragments. I started screaming,” Tamlin said. Earlier that year, Tamlin had noticed a lump on the same leg. “(The lump) used to get infected all the time,” she said. “It would turn red, hot and sore. Doctors told her not to worry – the lump was benign. Her mum, Kerrilee, remembers it well. “She had a lump on her leg and we’d been seeing someone for it and he kept saying ‘don’t worry about it’,” Mrs Hall said. “Eventually, after about 12 months, he decided to scrape it out. “I’m not absolutely sure what was going on in my brain that fateful afternoon,” Tamlin said. “I chose to use the outside steps. When Tamlin tripped up the stairs, she landed flush on the lump, causing it to rupture. Once again, the doctors were perplexed as to what was inside the lump. “It took them seven days and they came back and said, ‘Sorry, it’s lymphoma’,” Mrs Hall said. “Five days later they came back and said, ‘Sorry, we made a mistake – it’s not lymphoma it’s BPDCN and we need to start treatment today. Tamlin was the first child in a decade to be diagnosed with Blastic Plasmacytoid Dendritic Cell Neoplasm – a rare and aggressive cancer commonly found in men over 60. “I had to start treatment straight away if I wanted even a chance to live,” Tamlin said. Doctors administered massive doses of chemotherapy to minimise the cancer in her body so they could perform a bone marrow transplant to save Tamlin. “Treatment was soul-wrenching and just all-out exhausting, emotionally and physically,” Tamlin said. “Twice a week, for weeks on end, they would inject chemicals into my bloodstream, or the area of my brain. Cancer deprived Tamlin of all the things a young girl enjoys. “I missed being normal (and) having freedom,” she said. “I missed reading in my hammock on the upstairs balcony. “I missed saying hello to my friend who walked past my house every day. “I missed my privacy, I missed my bed. To suggest Tamlin is brave would be an understatement. Sometimes we don’t have the words to describe something so astounding. Facing death, Tamlin showed immense grace. “The nurses made my days okay,” she said. “They were the upside to the downside of my days; I got to know them as they got to know me. “They taught me about unimaginable compassion and overwhelming kind-heartedness. “I learnt about how everyone has a breaking point and how (we) can be glued back together. 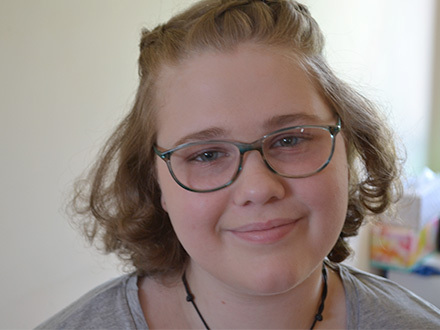 In February 2018, Tamlin was declared cancer-free. “I am feeling so much better than words could express,” Tamlin said last week from her home in Brisbane. “I couldn’t walk up a short flight of stairs without being out of breath and needing five minutes to rest. Tamlin is also attending classes again at St Rita’s College, Clayfield. “She can usually get there for a day, but then it takes another day or two at home before she can do it again,” Mrs Hall said. “She’s been going to a couple of subjects one day, nothing the next day … it depends on how she’s going. Tamlin was recently given a special robot, designed to help her to participate in classes from home. “For the last 16-and-a-half months, Tamlin has been trying to get back to school full-time, which has been a struggle, so she’s been self-educating,” Mrs Hall said. “(The robot) is going to make a world of difference. “Having the opportunity to be in class, even if she’s sitting in bed in her pyjamas because she just doesn’t have the physical energy, or mental capacity to be in a noisy class room. “It’s going to be a huge thing. “Cancer has had a major impact on her in all different aspects. “She wants to get back in there, she wants to be doing well and she wants to be able to do something with her life. “We don’t know what she’s got ahead of her. “A lot of the time we teenagers are forgotten about,” she said.